Reinforce your understanding of the musculoskeletal anatomy! 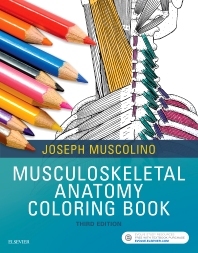 Musculoskeletal Anatomy Coloring Book, 3rd Edition is a must if you’re taking massage, physical therapy, chiropractic, orthopedic, and all other manual and movement therapy courses. This latest edition includes online access to The Muscular System Manual’s companion Evolve site, which lets you view informative videos, take practice tests, and more! Focused specifically on musculoskeletal anatomy, this fun, interactive and engaging coloring book includes 635 high-quality illustrations. Each chapter focuses on key anatomic parts of the skeletal system, muscular system, nervous system, and arterial system; plus, composite drawings of all body systems and structures provide a complete look at the anatomy you will need to know in practice. UNIQUE! Did You Know? feature in every muscle spread provides additional details to strengthen your understanding of musculoskeletal structures and functions. UNIQUE! Short-answer reviews test your knowledge and help you learn to interpret anatomic information. A unique focus on musculoskeletal anatomy reinforces concepts specific to manual therapy to help you study more efficiently. More than 630 high-quality, anatomically detailed illustrations enable easier, more effective review. Accurate, streamlined coverage of musculoskeletal information simplifies the review process and emphasizes concepts essential to manual therapy. A clean, consistent page layout clearly illustrates the relationship between muscles and surrounding muscle groups. Fill-in-the-blank self-study exercises with accompanying answer keys help you prepare for exams.